Lowdown: To save his life, a man must don a cyborg suit and head for an orbital station where the rich and powerful reside in isolation. Nowadays it’s all but impossible for cinemas to offer a superior experience to that of good home theatre. Barring specific exceptions that can be counted using a single hand, the home offers much better potential for quality sound; and flat screen TVs and projectors can rival the envelopment experience offered by your average multiplex’ image. Cinemas are down to marketing themselves on the basis of exclusivity, something I personally don’t care much for when all I need is wait 3-6 months for that “next best thing” to arrive at my home environment. Melbourne’s Astor Theatre defies that equation, though. This old theatre has never been converted to a multiplex. It still has the proper lobby, it still has a huge hall, and it still has a huge screen – just like the cinemas I grew up on. However, it’s up with the times when it comes to quality projection and sound (eclipsing, IMHO, that of the supposedly superior Melbourne IMAX). I haven’t been to the Astor for years, pretty much since I became a parent. Last week I got the opportunity to rekindle an old flame and with good material at that: a proper science fiction movie, Elysium. In all honesty I did not know much about Elysium prior to attending the cinema. However, it did not take long at all for me to realise this is another piece of science fiction filming by the guy behind District 9, Neill Blomkamp: the styling (and many of the actors) are too similar. Set some 40 years from now, it tells the tale of a crumbling and overpopulated earth that was left to rot by the wealthy as they moved themselves to a heavenly space station, Elysium. From there they control the world harshly using a massive army of robots while the citizens of the earth provide the cheap labour required to support their ostentatious lifestyle. This setup leaves us following two key characters and plenty of supporting acts: on one hand there is Elysium security chief (Jodie Foster), while on the other we have a guy fighting hard to keep his earthly job at the factory in a world where hardly anyone can get a job (Matt Damon). The latter tries so hard he ends up on the receiving end of a massive dose of radiation that would leave him dead in a manner of days. His only hope is to go "upstairs" to Elysium and cure himself through one of the devices each household there has: a scanner that fixes all diseases at the atomic level. Just think what one of those devices could achieve down on earth were the elitists allow it to be deployed there! Getting up there is not easy, though. The Elysiumites have a tendency to blow uninvited visitors up. They also have earthly agents (Sharlto Copley, of District 9 fame) that are very well armed to help with their dirty work. Besides, our hero is weak and sick. A cyborg like suit he acquires, that amplifies his muscles, offers him a starting chance. At its core, Elysium is a tale of class wars. On one hand there's Elysium, the land of plenty, that doesn't want to share; on the other hand there is earth, with its poverty, ill health and unemployment. We all cheered when Matt Damon gave those evil bastards a taste of their own medicine, but come on: who are we really barracking for? Australia just voted to "stop the boats". And who are those boat people? They are the exact likes of Damon's character, living in even worse conditions, who seek to come to a land where they could get health services and lead a decent life. All the while Australians buy themselves more clothes and gadgets than they could ever need, made with the blood of those digging up the minerals making up the batteries to the blood of the zero paid Chinese factory line worker. If you want to catch a glimpse at the baddies from Elysium, all you need to do is take a look at the mirror. Class wars aside, there is an action movie there. It's a spectacular action movie, made even more spectacular through the Astor's huge screen and decent sound. It's nice and all, but it ain't as good as District 9; while the earlier movie proved to be nothing like anything we've seen before, Elysium is a movie we've seen many times before. Perhaps not in a semi apocalyptic future setting, but definitely in more ways than none. It is often predictable in the sense of "given that we are now in the middle of the second act, it is time for the hero to suffer a setback". These problems are not severe, but they're definitely noticeable. It is a pretty safe bet for me to say I will remember Elysium mostly for its depiction of a very likely future. Perhaps it won't happen in 40 years time, but between global warming, overpopulation and technological improvements implying the lesser skilled do not stand a chance of getting a job in a capitalistic society, either our children or our grandchildren will have to face the same problems Damon's character does. Unless, of course, we wake up to start sorting this world of ours. With the recent election of Tony Abbott, I do not hold my hopes up high. Not from Australia, not from the rest of the world. Overall: Grand science fiction that tells us a lot of the world we currently live in. A predictable story. Important lessons. 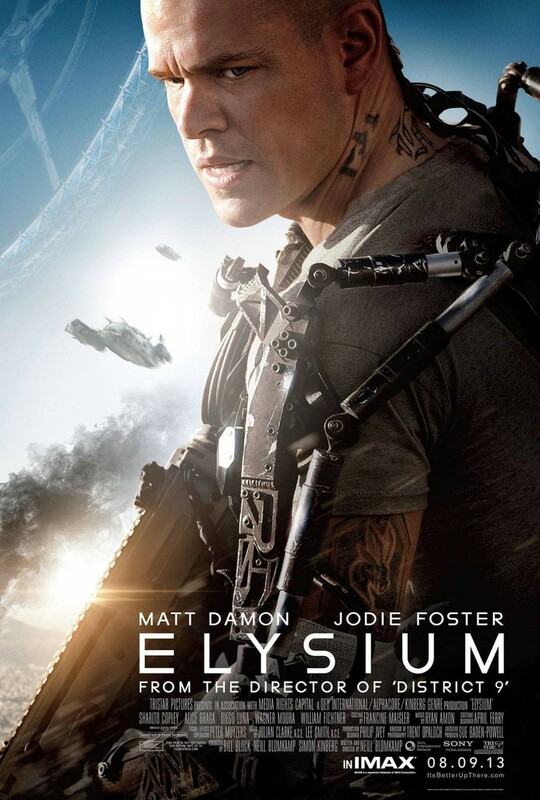 A mixed bag overall, but I'm a sucker for big time science fiction so I will give Elysium 4 out of 5 stars.